Currently, the broadcasting ecosystem operates as part of a packaged bouquet environment where consumers pay a fixed amount and receive a pre-configured bouquet of channels. Under the new channel pricing regime, the power of choice shifts to the viewers, who will have the freedom to choose their favourite channels and packs and pay only for what they want to watch. It also standardises channel prices across all service providers/ distribution platforms and ensures an open market operation that will lead to demand-led pricing in the category. 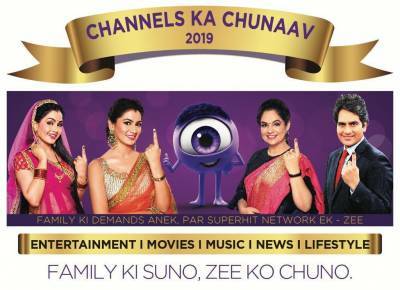 Championing the ‘Freedom of Choice’, ZEE is promoting ‘Channels Ka Chunaav 2019’ – a multimedia multi-stakeholder communication initiative, urging viewers to fulfil demands of all family members through ‘Family Ki Suno, Zee Ko Chuno!’ Keeping with the topicality of elections and the power of choice that has the ability to change status quo, Zee, with this campaign, aims to be the catalyst for the transformational change expected across the TV ecosystem. These packs start at a price of Rs 10 for 8 channels under Zee Prime Pack Tamil - SD and go up to Rs 120 for the ZEE All-in One Pack - HD that includes the entire range of ZEE channels. As part of its launch offer for Zee Keralam, the channel is available at a price of just 10 paise per month. Tailor-made to fulfil multiple demands from family, the ‘Zee Family Pack’ is targeted at the Hindi Speaking Market (HSM) and priced at Rs 45 per month for a suite of 24 channels, including Zee TV, &TV, Zee Cinema, &Pictures, Zee Bollywood, Zee News, Zee Anmol, Big Ganga, Zing, and Living Foodz among others, cutting across multiple genres such as entertainment, movies, news, music and lifestyle. To cater to the multi-genre needs of the premium viewers whose primary language is English, Zee has created the Zee Prime Pack English SD that includes premium channels such as Zee Café, & Flix, Living Foodz and WION, priced at Rs 25 per month and the HD pack that includes & Prive HD in addition to these at Rs 35 per month.